Innovations presented at Achema 2018 are the result of an innovative internal project called AUTOMATION 2020 whose main goal is to identify the best technological solutions in automation, applying them as a standard to MG2 products. Exhibitor: MG AMERICA - MG2 S.R.L. MG2 strengthens its engagement in the pharmaceutical/cosmetic packaging industry for which the company designs, produces and sells both end-of-line and serializations machines. An excellent example is the project for an important North-American multinational company. During the last years MG2 strongly invested both in the study and in the development of containment technology. These systems designed and sold by the Italian company are intended to safeguard the operator, the product and the environment. The Düsseldorf fair represented a milestone in MG2 growing process which started two years ago. In 2016, MG2 experienced a double-digit increase of both orders and turnover , a trend that will be confirmed again in 2017. 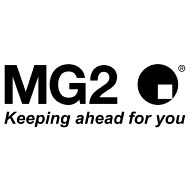 The Düsseldorf fair represented a milestone in MG2 growing process which started two years ago. In 2016, MG2 experienced a double-digit increase of both orders and turnover, a trend that will be confirmed again in 2017.